This has a large, closed body with heavy doors at the center of the left side, giving access to the chamber in which contaminated articles are arranged for treatment. Decontamination may be carried out by steam or hot-air treatment, mixed with suitable chemicals where necessary. The vehicle is completely equipped with an oil-fired boiler, fans, water tanks, etc., necessary for the work. This machine, like the personnel decontamination truck, is a six-wheel Henschel 23 feet 3 inches in length, 8 feet 2 inches in width, and 10 feet in height, weighing 9.7 tons. But in spite of those gassing technologies in their possession the Nazis allegedly preferred to gas numerous people with Diesel CO-free fumes sent in a hermetically sealed box that would have quickly exploded because of the internal pressure and killed nobody in sensible periods of time because of the too low level of carbon monoxide in Diesel fumes. 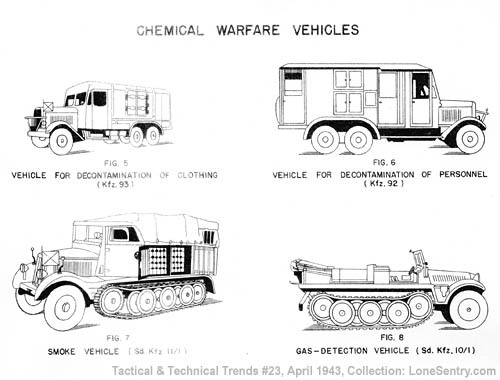 I don't know if those delousing gas vans gave the Soviets the idea of the alleged "Nazi gas vans" but those murder weapons were first talked about during Soviet 'trials' in 1943 (Krasnodar, Kharkov). I've also heard stories of Soviet murder gas vans used during Stalin's purges of the 1930's but I don't know if those stories are reliable or not. It does seem as though the holyhoax fantasies have some basis in fact. Much like someone watching children playing on a playground jungle gym being inspired to write a horror story about children being tortured on some strange and twisted mechanical device. Actual gas chambers used for fumigating clothes, bedding, etc. become homicidal underground caverns capable of murdering thousands at a time. It makes me wonder what the inspiration was for some of the really bizarre stories such as the pedal powered brain bashing machine. I find it hard to believe that such a story could be pure invention. Something must have 'lit the fuse', so to speak. I wonder if it would be possible to track down the reality behind such fantasies? I haven't a clue of how to go about it but I'm sure that it would make an interesting read if it could be done. On edit. Could the homicidal pedal powered device have been inspired by something as mundane as an old foot cranked grindstone? I've seen such grinding wheels that were used to sharpen cutlery, farm tools such as scythes and so on. Oh well, it's probably one of those little holyhoax mysteries that will remain forever unknown. A mobile delousing gas chamber? A mobile delousing steam chamber maybe? Your opinion? Thanks Hermod. That is pretty good evidence to present when arguing the origins of the gas van myth. Possibly a steam disinfector powered by wood as shown in the foreground? 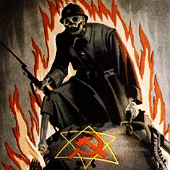 bidden to travel; into-the Reich. to undergo a period of quarantine. winter quarters for their soldiers.